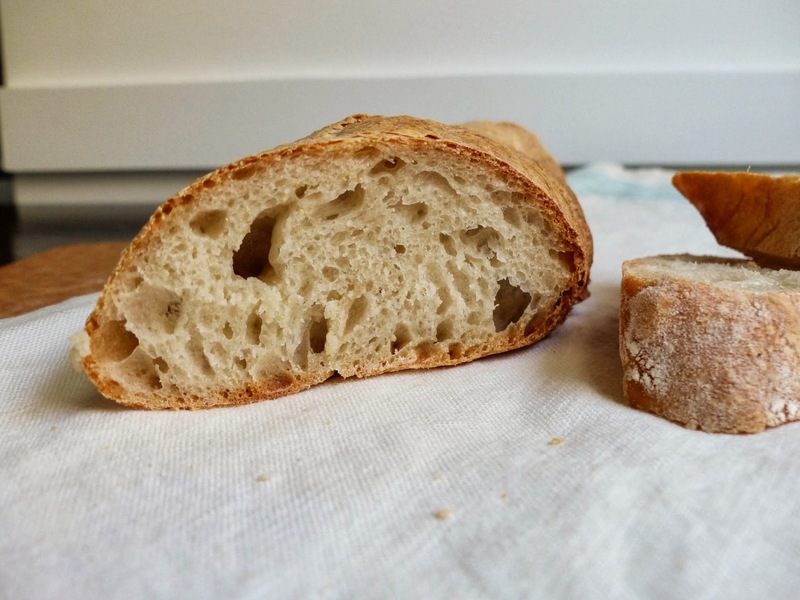 It's finally here, the last chapter we tackle in the book: Breads. Everyone has been anxiously awaiting this moment, ever since last year when we visited the bakery in Yountville and got hands-on instruction from head bread baker Matthew McDonald. 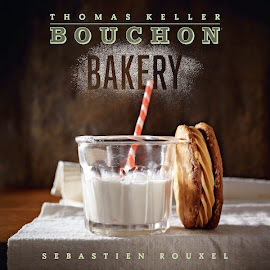 The book goes into extreme detail about the bread making process. It's essential to read and re-read the introduction a few times to get a good grip on what's needed. And it turns out what's needed is a bit of specialty equipment, lots and lots of flour, and practice. While most avid bakers are likely to have some of the necessary components, such as a baking stone and pizza peel, it's unlikely that anyone would think to have river rocks, metal chain and a super soaker on hand. Yet that's what is required to create bakery-quality crust at home without a commercial bread oven. And since we'll be using this setup every week for the next few months, it's worth investing in. This first bread recipe is a good introduction, bâtards. The dough is simple enough, just flour and water and salt, leavened by a poolish. The dough is meant to be very wet, and the shape is simple enough for a beginner bread baker. Having everything ready and in place is very important. Fortunately, the book helps you prepare, down to a timeline for mixing, proofing and baking the bread. 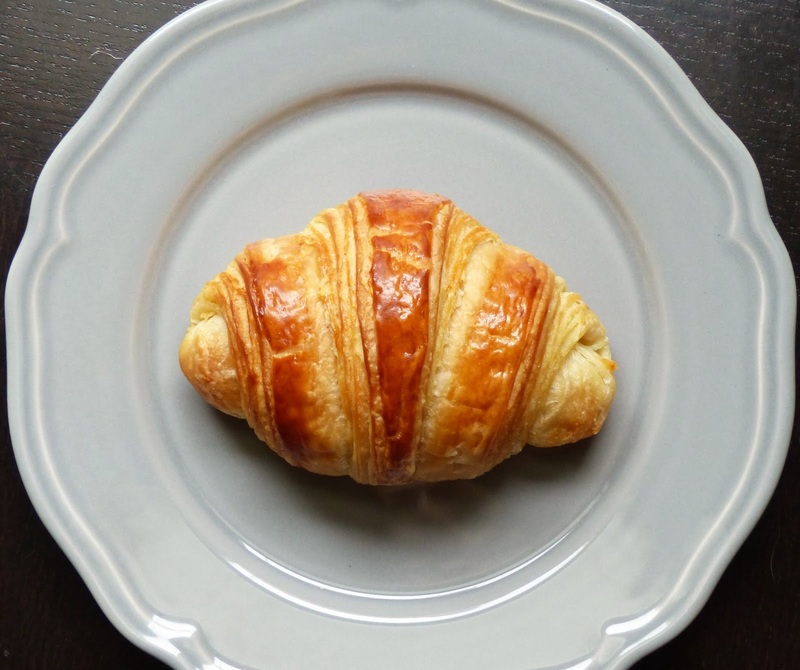 Our very last croissant recipe, and it's a great one! 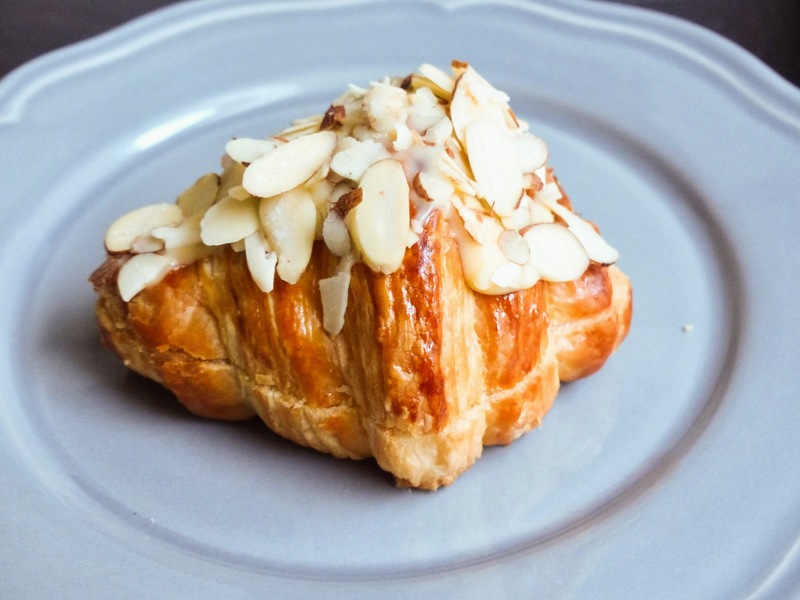 Almond croissants take regular, usually day-old croissants, and re-purpose them with almonds, almond cream, and almond syrup. Not a bad fate for the humble croissant! The rich buttery dough marries quite well with the nutty and warm almonds. It's the perfect way to use up leftover croissants at a bakery, although at home that might not be a problem. 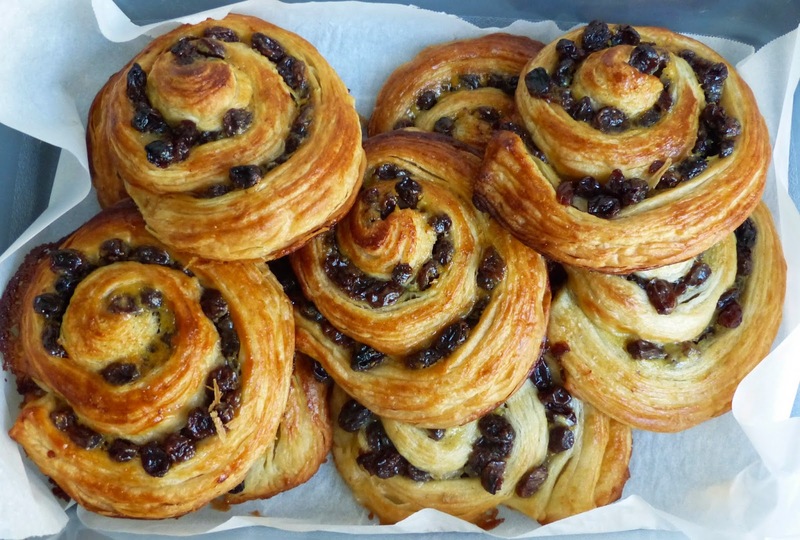 Continuing in the myriad uses of croissant dough, we have pains aux raisins. These delicious pinwheels are filled with pastry cream and rum soaked raisins, rolled up, sliced and baked. They are the perfect breakfast treat, and you can feel good about eating them because after all, raisins are fruit! How can you make a buttery, flaky croissant better? Add chocolate, of course! Pain au Chocolat translates to chocolate bread, but there is no way that name can adequately express the deliciousness that is this pastry. The dough is the same croissant dough we used last week, but instead of cutting it into triangles, it's cut into rectangles, and rolled up over two chocolate baking sticks. The result is still an amazing croissant, but with rich and decadent chocolate in the center. If eaten while still warm, the chocolate is soft and melty, the ultimate indulgence. Now that we have made our croissant dough, we can make croissants! First up, are traditional croissants. The crescent-shaped flaky buttery pastry is enjoyed all across Europe for breakfast along with a latte or cappuccino. It's too bad that tradition hasn't caught on here in America! Instead, we rely on ready-to-bake crescent rolls or croissan'wiches, a pale comparison to the real deal. Although this recipe takes some time, it's not complicated or difficult. Once the dough is made, rolling the triangles into crescents and baking them is a snap. With a little advance planning, it's quite easy to enjoy home made, freshly baked croissants as often as you wish. They even freeze well, so you can make a big batch and save some for later.